in-house printing up to 17" x 22"
Restore your broken frame or replace the glass. We can repair loose miter joints and address certain finishes that need a facelift. Glazing replacement is also available with many options to choose from, including UV filtered glass or acrylic to help protect items from UV damage / fading. Anti-reflective Museum Glass is also available. Do you have framing from the early 90's or older? Bring your piece(s) in for an evaluation and we will let you know if they should be upgraded to the current industry standard of conservation matting and backing, protecting your art from acid-burn / discoloration. 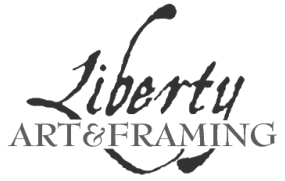 Liberty Art & Framing houses a highly accurate computerized mat cutter (CMC), allowing us to cut mats of just about any size and shape with numerous openings and layers. Turn-around is quick and we can truly customize any project to suit your needs, whether you only need one mat cut, or a hundred. We also sell and cut 1/8" thick mirrors to size, up to 36" x 60". For 3/16" thick 1-1/4" beveled edge mirrors, we have several standard sizes to choose from: 16"x20", 20"x24", 22"x28", 24"x30", 24"x36", 24"x60", 30"x40", & 36"x48"